David Millar has been banned from cycling for two years and stripped of his 2003 World Elite Time Trial title. The punishment has been handed down by the British Cycling Federation after the 27-year-old Scot admitted taking the blood-boosting drug EPO. "The panel decided that the facts of the case constituted offences of intentional doping," a statement said. His sister Frances said her brother was considering his options and may make a statement on Thursday. BBC Sport understands he would have retired if he had been given a four-year ban. Millar, who has also been fined £860, admitted taking EPO during questioning by French police last month. An independent disciplinary panel sitting for the BCF considered information from a number of sources and also questioned Millar before finding him guilty. The panel was allowed to consider factors surrounding the offences before deciding on an appropriate punishment. 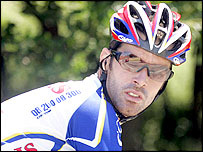 It also disqualified him from the 2003 Dauphine Libere Stage race and the 2001 Tour of Spain. Millar has no right of appeal to British Cycling, but may appeal independently to the Court of Arbitration for Sport. Millar was sacked by his Cofidis team and has since said he hoped to get no more than a one-year ban so he could help prevent other riders from taking drugs. He had already pulled out of the British Olympic team. Millar's disqualification hands the world time trial title to Australian Michael Rogers. The Scot initially privately admitted his guilt to a French judge, Richard Pallain on 1 July, after two syringes containing traces of EPO were found in his Biarritz home. The Scot told Pallain that he had taken on three separate occasions, an admission he later repeated to police on 20 July. Millar told the police: "I had always dreamed of becoming a world champion; I had reached that aim but I had cheated. "I took EPO when I was in Manchester and the two syringes found at my home were those I injected myself with in Manchester. "I had taken them back home not to forget that I had become world champion in Hamilton while being doped. "I drugged myself because I was a prisoner of myself, of fame and money. I believe that those two syringes were the witnesses of how ashamed I felt to have used drugs. "I am not proud to have drugged myself; I am not happy about it. I was a prisoner of the person I had become." Millar told the police he had been introduced to EPO by a team-mate ahead of the 2001 Tour of Spain. "I took EPO because I knew the Cofidis team was going to Spain for the Vuelta on that condition that I would do it and get a result. I could feel the pressure," he said. Prior to that, Millar had been struggling with injuries, glandular fever and problems in his personal life.